In one week, I’ll be sipping coffee and making final preparations to leave for ZinCon 2016! My sixth one! 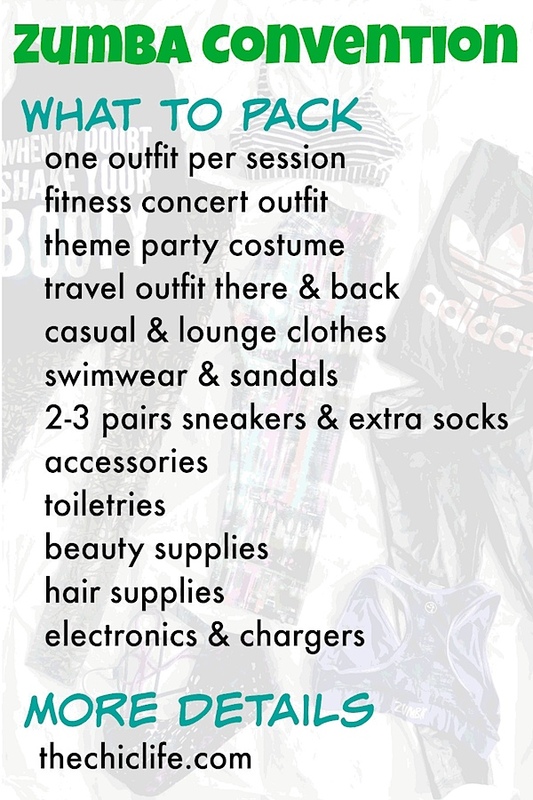 Now that I’ve been to this event five times before, I thought it may be helpful to share some of my packing tips for what to bring to Zumba Convention. I’m going to start with the high level groupings and then add tips from there. Rather than telling you exactly what to bring, item by item, I’ll give you the general ideas along with tips on why I’m suggesting what I’m suggesting. This is just a general guideline since we all pack differently and like to bring certain things to be comfortable. What you bring may also depend on how you’re getting to Zumba Convention. I typically bring a little more when I drive there, but I’ll be flying this time around. Ok, on to the packing list! ZinCon can be a bit of a fashion contest. 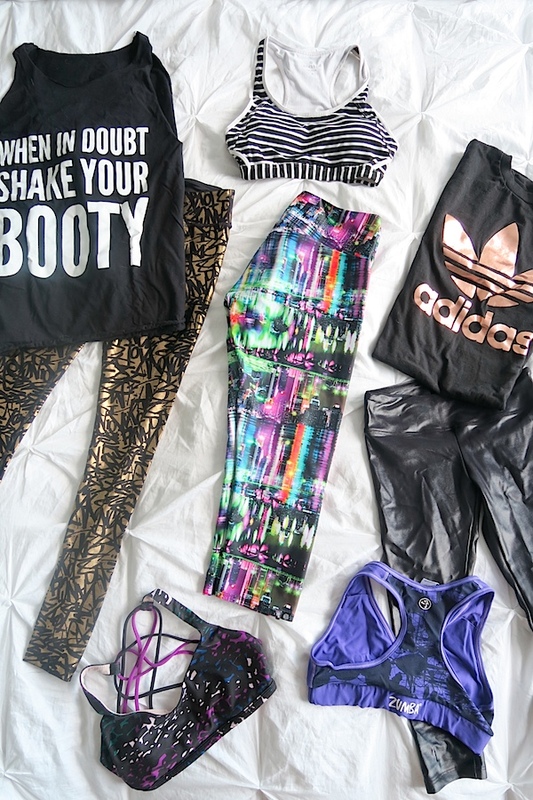 So, if you love the fashion of Zumba, bring your best outfits. I love seeing all the cool outfits the attendees put together. Not just for the theme party, but even the every day attire is interesting to me. one outfit per session: Think head-to-toe per outfit (pants, sports bra, top, undergarments, and socks). I may not actually wear every outfit, but I’m really not a fan of hanging out in sweaty workout clothes. If you often do multiple classes in a normal day and don’t mind wearing the same outfit for them, you may not need to pack this many workout ensembles. I don’t mind wearing the same outfit if the classes are back to back. But, what I find happens at ZinCon is that you’ll have an hour or two in between sessions, and wearing the same clothes can get uncomfortable. Also, I like to wear outfits that fit the theme of the session, so I’ll try to pick something to go with the session I’m attending. I also recommend sweat-wicking clothes if you have them. fitness concert outfit: Most people seem to wear regular workout clothes to this event, but you could do something extra special if you wanted. theme party costume: If you haven’t seen the theme of the 2016 Zumba Convention, click here. I’ll be rocking some sort of formal attire with sneakers, most likely. 2-3 pairs sneakers & extra socks: Because of all the dancing, your shoes will probably get pretty sweaty. Think about how your shoes are after a long Zumbathon. Plus, you’ll have the heat and humidity of Florida going on. I like to have at least 2 pairs of sneakers to give them a rest in between sessions or days. I also like how some shoes match some outfits better. accessories: Have fun and bring accessories to go with your outfits. Zumba bracelets, headbands, funky jewelry. Whatever makes you happy. You can check out my blog posts and vlogs for previous ZinCons here if you want to get more inspiration and see what others have worn in the past. Maybe this year I could take pictures of my favorite outfits and share them with you? What do you think? Zumba Convention is definitely a place to have fun with your outfits. I always say I never see so much neon or fishnet. There are also really cool cut shirts going around, as well as other unexpected looks. You know what toiletries and beauty supplies you like. But, here are some tips while you’re deciding what to bring. toiletries: You’re going to sweat a ton. Bring a strong deodorant and consider one (or bring an extra) you can keep in a bag with you that you take from session to session. Remember your favorite skin care items. Florida is hot and humid, so take that into account. You may want to bring face wipes or water spray to freshen up in between sessions. beauty supplies: This is a great place to experiment with fun makeup looks. If you’ve wanted to try something bold, go for it here! I like to bring a little more of my higher pigmented makeup and glitter. hair supplies: Remember your favorite shower supplies, styling products & tools, and what I consider clutch – hair elastics. If your hair tends to get frizzy, you may want to bring something extra to combat that Florida humidity and Zumbaholic-packed conference rooms. Tip: I also like to bring a couple pampering treats, like soothing foot lotion. You’ll be on your feet so long each day, it will be a welcome relief! swimwear & sandals: It is Orlando, the land of sun. Ok, not sure if it’s called that officially, but almost every hotel has a pool area. I only made it to the pool once last year, but it is fun to spend at least a little time pool side. Remember your favorite bathing suits, sunglasses, and sun protection product. casual & lounge clothes: I like to bring comfortable clothes for sleeping and hanging out in the hotel – sweatpants, t-shirts, and all that fun stuff. Think about what you’d like to wear before and after sessions. To breakfast. To Dinner. Lunch will probably be something quick in between sessions, so you’ll probably use a workout outfit for that. Remember comfy things to lounge in at night. I like to bring fuzzy socks. Note: I sometimes do one dinner outing in Orlando, but the schedule is so packed, this can be difficult to fit in. But not impossible! If you’re going with a group or meeting friends there, this could be a fun outing. So, pack an outfit accordingly. There are plenty of great restaurants in between all the ZinCon venues so you could easily have a great meal with your friends and/or family without leaving. electronics & chargers: I love to bring my phone, laptop, and camera. You may want to bring your iPad, Kindle, or other electronic. Remember your charger (or one of those cool, portable power chargers you can fill up ahead of time)! Bring any other entertainment, etc. you’d like. Books, magazines, whatever floats your boat. Tote/Backpack: You may not have time to go back to your hotel room in between sessions. So, you may want to bring a bag you can use to carry some day time essentials. I like to bring my own bag, but Zumba Convention typically gives you a tiny backpack or tote when you go to registration. Between Sessions: For the previous point, consider bringing snacks, travel sized deodorant, or anything else you may want to freshen up and prep between sessions. Think about what you’d like to have in between basically two or more Zumbathons because that’s what it’s going to be like. And that’s pretty much it! Hope this post was helpful for you! What would you add to this list? You can check out my other Zumba Convention blog posts here. If you’re looking for more healthy living inspiration, check out my Pinterest boards. I’ve been pinning like crazy and have a lot of fun pins to share with you. Are you going to Zumba Convention? What do you always forget to pack? Thank you for the tips, I’m a little overwhelmed and this for sure helped me. hope to see you there. I watched your videos and saw that you used to leave here in charlotte.